As we sit on the stone bench beneath the thousands of names inscribed behind us, my Belgian cycling guide Marnick and I reflect on our existence. If the bullet that wounded my grandfather had struck him a fraction higher, his name may have been on this wall at Tyne Cot Cemetery, and I would not be here. If Marnick's grandfather had not fled his village as the Germans advanced and evacuated his family to Ypres, his wife and baby may not have died from typhoid. He may never have joined the Belgian forces and met his second wife. Marnick would not have been born. I knew my grandfather well. It's a moving experience for me to trace the journey of Arthur Dean, infantryman, aged 22, of the Australian 1st Division, 2nd Brigade, 7th Battalion. 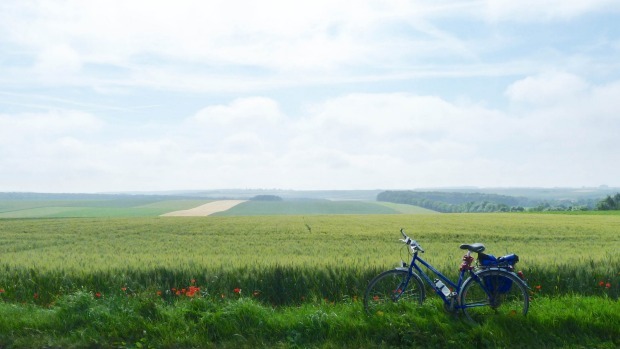 Thanks to the maps of a self-guided cycling tour, my wife and I can follow almost the exact route he took from Amiens in France, through the carnage in Pozieres, over the Belgian border, around Hellfire Corner on the Menin Road by Ypres and towards the disastrous bloodbath at Passchendaele. There's no comparing our efforts to his – he spent more than two years slogging through mud, shellfire and mustard gas. We're cruising it in a few days on bikes. The diggers saw a country almost devoid of landmarks. 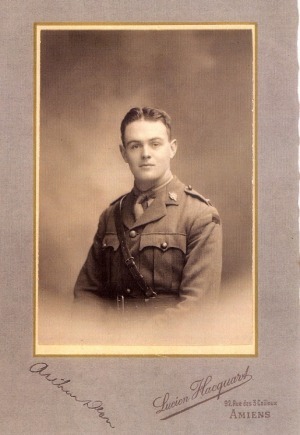 Arthur Dean's letters to his mother (they're now in the War Memorial in Canberra) always begin 'Somewhere in France'. No doubt army censors were being cautious; maybe he really didn't know his exact location. Our tour company has provided detailed instructions referring us to sights along the way. Arthur Dean slept in tents on good days, in ditches and shell holes on bad ones. We're booked into comfortable hotels. Nonetheless, cycling the route gives a much better feel for the terrain than we could get in a car. There are no alps here, but the rolling hills have us puffing. I try to envisage trudging up them carrying 30 kilograms of equipment. We begin to understand why fortified positions on marginally higher ground were so bitterly contested. On the bikes we can cut through little tracks between fields of wheat and maize. There are well-surfaced country roads with few cars. Riding the recommended 55-60 kilometres a day certainly could be challenging in bad weather. But the spring breeze is at our backs and shortcuts are suggested in the route guide. The only danger to us is the risk of being sideswiped by a British minibus on a Flanders Fields tour. 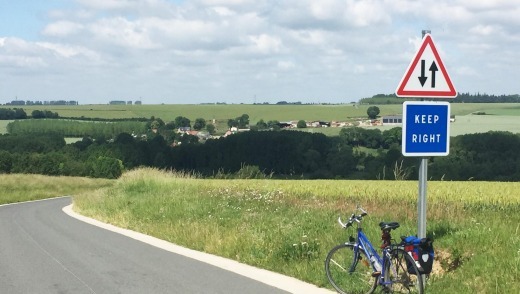 "KEEP RIGHT" warns the roadside sign near Thiepval Ridge – in English. On the week-long trip we have time to explore the towns of Amiens, Albert, Arras, Bethune and Ypres. Their museums are interesting and their lovely civic squares look as if they've stood for centuries. In fact they were largely flattened in the Great War, with further damage done in World War II, so most of the buildings are newer than our 1920s bungalow in Sydney. On my final day in Ypres I meet Marnick, who takes me on the bike along the route the 7th Battalion took in late summer, 1917. He shows me a sepia photo of the camp of the 1139 and 56 officers outside Chateau Segard. And there's the real scene in front of us, easily recognisable. There are farm sheds where the chateau once stood, but two concrete British bunkers from the photo are still there. Then we ride on, circling the busy roundabout that was once Hellfire Corner and up the Menin Road. We catch our breath at the field where the Australian battalions assembled, waiting to advance through Glencorse Wood. 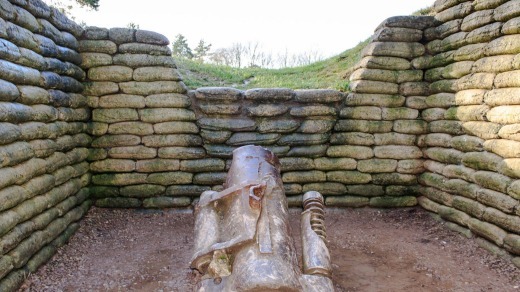 At 5.40am on September 20, a rolling artillery barrage began pounding German positions and the infantry, having had little or no sleep, advanced behind it. A fortnight later they were bogged down just two kilometres further on. It takes us only a few minutes to ride to the corner of Molenaarelst, near Broodseinde hamlet. "As close as I can tell, this is where your grandfather was shot in the leg," says Marnick. We both know the wound was in the buttock, but Marnick is being delicate. A couple of grazing cows raise their heads to watch us. A blackbird sings. 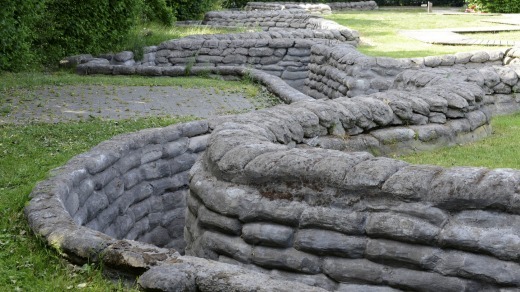 During September 1917, the Australian 2nd Brigade lost 46 officers and 982 men. Almost all the ground they gained in the push towards Passchendaele was retaken by the German offensive of April 1918. It's a privilege to be alive. 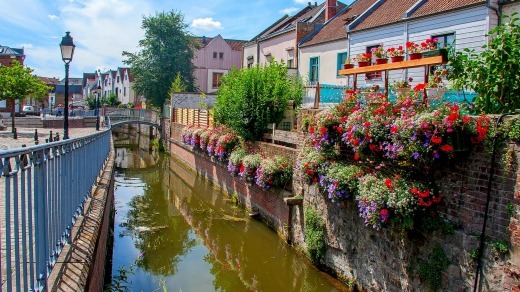 Utracks' eight-day self-guided Cycle the Western Front tour including bike hire, route instructions, accommodation and luggage transfer costs from $2090pp. See utracks.com or phone 1300 303 368. 5. 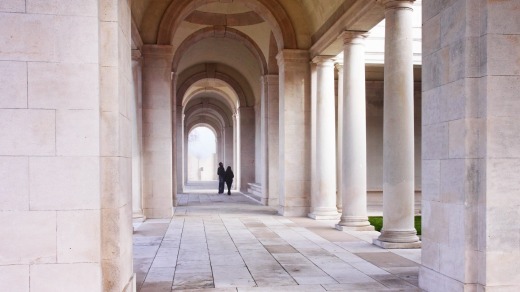 Menin Gate, Ypres, Belgium. 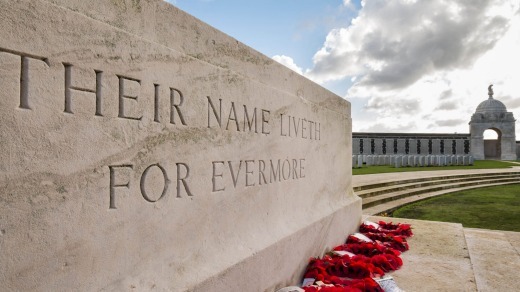 The last post is played at 8pm in a ceremony that's been held since 1927 at the portal to the town, on which are inscribed the names of thousands of Commonwealth soldiers whose graves are unknown. Richard Tulloch was the guest of UTracks and Visit Flanders.